Creating Recipes with a Cause! I am a proud DFT blogger. To learn about DFT, click here! When someone in the family has diabetes, it does have a big impact on the rest of the family, so it becomes even more important to Incorporate comfort foods that are diabetes-friendly as well as boost your nutrition and good and healthy enough for the whole family to sit down and enjoy the meal together . There’s something about a this super simple, tasty and healthy wrap. that’s so satisfying to make and eat! 1.Soak dal in three cups of water for about an hour. Drain and grind with ginger, green chillies and salt to a smooth batter. 2. Add red chilli power and mix well. 3. Heat a non stick pan or a Crepe pan and spray with a little cooking oil spray ..
4. Spread a ladle full of batter to a thin disc. cook on medium heat till the underside is done. 5. Carefully flip over and cook till the other side is done.. Blend all the ingredients under dressing to a smooth paste . If the dressing becomes too thick then add a little water to thin it out ..
1.To assemble each wrap, spoon about 1/4 cup bean filling down center of 1 crepe..
2. Roll up the wrap and enjoy along with any left over filling on the side.. Lets look at the benefits of the ingredients used in making these wraps .. If you’re looking for foods that raise blood-sugar levels slowly and gently, choose high-quality carbohydrates instead of low-quality carbs like refined grains and sugary foods. Whenever possible, you’ll want to couple these carbs with protein and/or healthy fat. Beans (including black, white, navy, lima, pinto, garbanzo, soy, and kidney) are a winning combination of high-quality carbohydrates, lean protein, and soluble fiber that helps stabilize your body’s blood-sugar levels and keeps hunger in check. Beans are also inexpensive, versatile, and virtually fat-free. Because of their low carbohydrate content, tomatoes can play a big role in controlling blood sugar levels. The low carbohydrate content also helps lower calorie intake and can help diabetics to lose weight. Tomatoes are a rich source of antioxidants and help restore the body’s oxidative balance. Peppers are packed with fiber and relatively low in calories and carbohydrates, they are an excellent choice on a diabetes diet. peppers are considered a nonstarchy vegetable — which means that most of the carbohydrates found in peppers are in the form of fiber. I am not a nutritionist or dietician. My knowledge and information is based on my research and reading from different resources. Please consult your doctor or dietician before making any changes to your diet. Diabetes Friendly Thursday; First Anniversary Special !!! 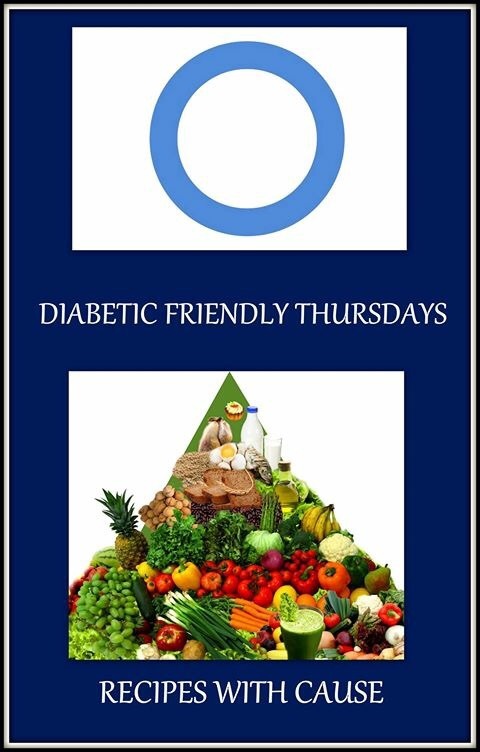 Diabetes Friendly Thursdays completes 1 year in April. To celebrate the joy and hard work of working on DFT for an year, team DFT is bringing a collection of Diabetes Friendly Recipes from individual contributors. BOOKMARK this post for the future reference. Sonal Gupta (the thinking mind behind the name & concept) started Diabetes Friendly Thursday last year in March I met her through a fb group and we are friends since . Did I mention Sonal is my mentor and if it was not for her I would never have blogged ..
Click on the picture for recipe. 4. 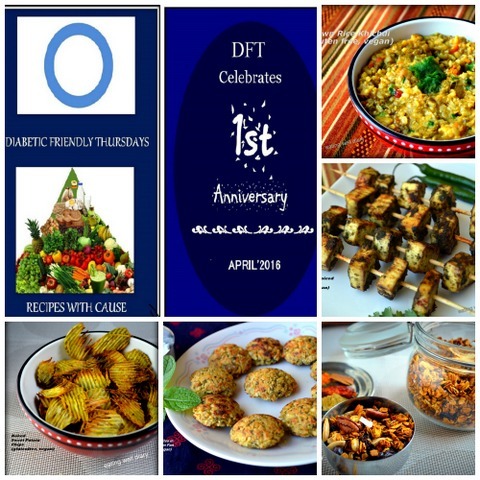 Kadhai Chhole With Fresh Dill Leaves…..
Let us meet all the Creative & talented bloggers who contributes towards DFT posts every month..
Swati is the creative one who designed our new DFT badge and make all those beautiful Collages every month .. Her blog is full of mouth watering vegetarian as well as non vegetarian recipes..
Swati blogs from Lets Cook Healthy Tonight. Apsara is our Gluten free recipe queen and has a wide knowledge in healthy living and food. Apsara blogs through Eating Well Diary ..
Pravathy is the baby of the group . She is one fun loving girl which reflects in her blog Crackle and temper . Suchitra is a physical therapist by profession and a mom of two young children . She loves to cook fresh meals for her family daily . Suchitra blogs from Su’s Healthy Living . Last but not the least comes Sarika … Sarika is full of life and it reflects in her blog Spice Zone. FOR MORE DIABETES FRIENDLY RECIPES , CLICK ON The Pics below ..
Sweet & Sour Kachoris for Holi…..
Holi is a spring festival also known as festival of colours, and sometimes festival of love. It is an ancient Hindu religious festival which has become popular with non-Hindus in many parts of South Asia, as well as people of other communities.. The festival signifies the arrival of spring,a season of joy and hope, end of winter, and for many a festive day to meet others, play and laugh, forget and forgive, and repair ruptured relationships. Gujiyas , mathri, kachoris, sweets and other Deep fried snacks are prepared & once you eat one, you’ll always go back for a second. The festival is filled with so much fun and frolic that the very mention of the word ‘Holi’ draws smile and enthusiasm amongst people. Every bite of these Crispy, flaky roundels with a delectably sweet,Sour and spicy filling of seasoned moong dal is worth a fortune! The secret to perfect kachori is to ensure the pastry is short, yet pliable enough to wrap thinly enough around the filling without creating holes which may break them whilst frying. Take care to deep-fry these kachoris on a very slow flame to ensure even cooking and also to make the crust nice and flaky. Taking these Sweet and Sour beauties to Sonal’s holi collective ..
1.Mix together all the dry ingredients. 2.Rub in the ghee and oil until the mixture resembles coarse breadcrumbs. 3.Add enough cold water to form soft dough. Wrap in cling film and refrigerate it for one hour. it into to a coarse paste. 2.Heat oil in a pan and add asafoetida and dal paste . 3.Cook it on medium high heat for 3-4 minutes. 4.Add sugar, ginger, chilli, cumin, coriander, and fennel powder and mix it well. 5.Now add sesame seeds, raisins, and coconut, salt and lemon juice. 6.Cook it for 10minutes or till all the water evaporates and the lentil is cooked. 3.Now roll the balls into small discs to fit in the filling . dough around it and make small roundels. that it is sealed properly. for around 10 minutes on the kitchen counter to dry out a little. 7.Heat enough oil in a wok to deep fry the kachori . 8.Each batch needs to be fried on a medium low flame for around15- 20 minutes until golden brown in color..
9.Remove from the oil and drain completely.. I like to serve these with fresh coriander chutney, tamarind and date chutney or fig chutney. I am a proud DFT blogger. To learn about DFT, Click on the picture above ..
March is the month of start of Spring and cleansing of house and yards and discarding the old and welcoming the new. Let’s begin the onset of spring with some healthy PROTEIN PACKED Salads! In our house We eat Salads as one of the regular rotation for lunch especially during summer months . My kids love to add loads of leafy greens along with carrots , cucumbers fresh mushrooms and other fresh vegetables and sprouts in their salads along with grilled chicken, shrimps, or fish.. I myself love to Sprinkle some nuts or seeds on top, add a few dried cranberries, some avocado chunks to take it to the next level and they’re filling enough to make into a main dish. Today I bring to you one of our favorite Asian flavors inspired tofu salad The slices of protein-rich tofu that top this salad is lightly seasoned in low sodium soy sauce and chili flakes and grilled to give it a bold, rich flavor Plus, they’re filling enough to make into a main dish. Blend all the ingredients under dressing to a smooth paste . If the dressing becomes too thick then add a little water or low sodium soy sauce to thin it out . 1. Heat a medium size skillet and add 1 tsp oil . 2. Once the oil is hot add all the ingredients for salad and toss for a minute EXCEPT GRILLED TOFU . 3. In a serving bowl add the tossed Salad , Top with tofu and serve with the salad dressing on the side . Lets look at the benefits of the ingredients used in making this Salad.. Eating cabbage is an inexpensive way to add vitamins K and C, as well as antioxidants, to your diabetes-friendly diet. Cabbage also contains manganese, fiber, and vitamin B6. This low-carb veggie is at its peak in the fall and early winter. Pick a head that’s firm with shiny leaves. When you get it home, put it in the refrigerator. Cover it with plastic wrap once it’s cut to slow down the loss of vitamins. Experiment with recipes that use this low-carb vegetable raw as well as cooked. The glycemic index estimates the effect of a food on your blood sugar levels, with foods having a low score being less likely to cause spikes in blood sugar levels than those with a high score. Lettuce have very low glycemic index scores, according to the American Diabetes Association, so you don’t have to worry about them greatly increasing your blood sugar levels. Rich in the antioxidant beta-carotene, vitamin A, B, C and K, magnesium, folate, and dietary fiber, carrots are bright in color and provide a sweet taste. Carrots are a good choice if you have diabetes as their carotenoid and vitamin A content helps protect your eyes from diabetic retinopathy or damage to the blood vessels in the eye from long-term diabetes. Carrots are a great low-carb, crunchy snack. The Joslin Diabetes Center recommends that adults get 20 to 35 g of dietary fiber each day, especially if they are diabetic, as fiber slows down the absorption of carbohydrates. Tofu has an excellent balance of the nutrients required to lower blood sugar levels in type 2 diabetics. CalorieKing.com states that a fourth of a block of firm tofu only has 117 calories, but also 7 g of fat, 12.8 g of protein and almost 1.9 g of fiber. Tofu can be grilled, baked, used in a soup or in a stir-fry dish. Galette is a term used in French cuisine to designate various types of flat round or freeform crusty cakes usually filled with a sweet or savory filling..
Samosa galette is less fussy than a traditional samosas and offers crisp crust. The flavors can be kept hot , medium or mild according to your taste and mild it can be a great way to introduce Indian dishes to your family and friends .. So lets Transform one of the most favorite Indian street food into this Galette which is so much easier than making the traditional, triangle shaped samosas which are deep fried. Bringing these super easy and delicious galettes to Angie’s Fiesta Friday #108 which is comhosted this week by Suzanne @ apuginthekitchen and Zeba @ Food For The Soul.to share with fellow bloggers ..
1.Stir the flour and salt together in a large bowl. Sprinkle bits of butter over dough and, using your fingertips, work it into the flour until the mixture resembles coarse meal, with the biggest pieces of butter the size of tiny green peas. 2. In a small bowl, stir together yogurt , lemon juice and water and add this to the butter-flour mixture. 3. With a wooden spoon, mix in the liquid until large lumps form. Pat the lumps into a ball. 4. Create a disk with the dough, wrap it in plastic wrap then let it rest for an hour or up to 2 days. 1. While the dough rests, boil water and cook potatoes until they are fork tender . 2. Once cooled, peel the potatoes and roughly chop them. 3. Heat oil in a medium pan over medium heat. Add the cumin and coriander seeds and cook until they start to pop. 4.Add onions to the pan and saute until it starts to brown. Add green chilies and ginger and saute for a minute more. 5. Stir in the cumin, garam masala, turmeric, salt and potatoes, . 6. Cook until heated through. Add the lemon juice and cilantro . 7. Let the fillings cool completely. Roll the dough to 1/8th inch and transfer into a baking sheet lined with parchment paper. Fold the pastry edge up and over to create a 2-3 inch border. Gently brush the top with milk. Bake for 45-50 minutes until slightly brown. Transfer the pan to a rack and let the galette cool. Serve it warm or at room temperature.